Cardassians suffers a bit from the same problems that haunt Invasive Procedures. 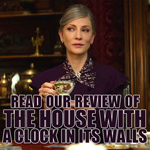 Here’s another solidly constructed piece of world-building featuring a wonderful guest cast and an intriguing high concept. 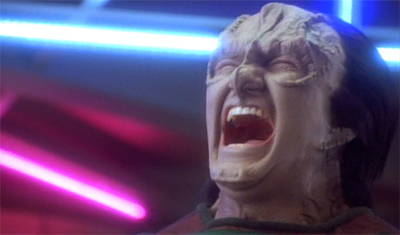 However, in the midst of all this, it seems like the human (er, Cardassian) element gets a bit lost. 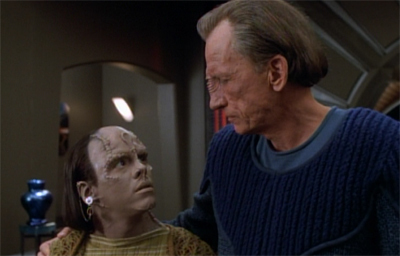 It’s great to have Garak and Dukat back on the show, and it’s great to deal with more fallout from the Occupation, but Cardassians never makes the emotional connection that a story about war orphans probably should. The set-up is interesting. Star Trek has always had a fondness for allegorical stories and social commentary. 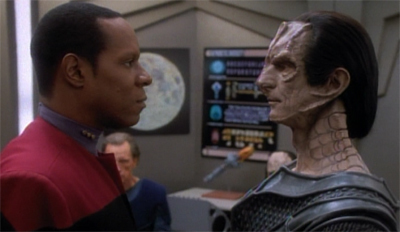 Given the interest that Star Trek: Deep Space Nine has demonstrated in telling post-colonial stories and those concerned with multi-culturalism, it seems like Cardassians might be a story about interracial abortion and racial identity. Granted, Worf already explored a lot of this ground on Star Trek: The Next Generation, as an orphan raised by humans trying to reconnect with his Klingon roots, but the situation between Bajor and Cardassia is at least interesting enough to support a single story. After all, Rugal isn’t being raised by the all-tolerant Federation. He’s being raised by the people that his fellow Cardassians subjugated and oppressed (and, if The Circle is any indication, plan to do so again). 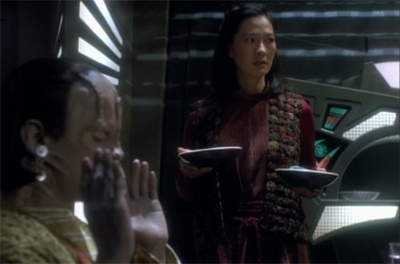 It’s suggested that Rugal’s situation is not unique, and the story teases a glimpse into this part of Bajoran-Cardassian culture, one which must be rather strange and delicate. How does Rugal deal with his heritage? What do his parents teach him about Cardassia? In a nice touch, the episode ends with Garek greeting a station resident in the background who seems to be Bajor. 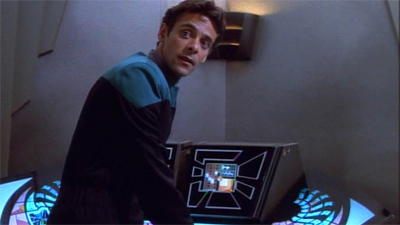 He’s too far to see the ridges and the short sequence takes place in the background of a shot focusing on Bashir, but he’s a human-esque figure in civilian clothes. It’s a nice, subtle coda to the episode which suggests that perhaps the healing is beginning to occur, and that perhaps these old wounds might eventually start to ache a little less. Unfortunately, the opportunity for this sort of character development is rather limited. 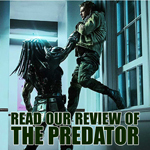 Rugal winds up feeling more like a political football as the story broadens its focus to explore the political scheming taking place. 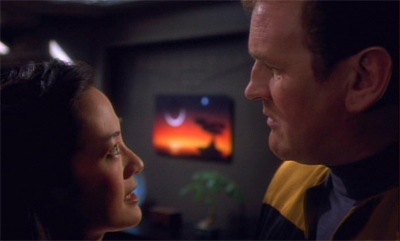 The closest we get to character development occurs when he shares a scene or two with the O’Brien family, but it’s far too fleeting to make any lasting impact. Like Jadzia in Invasive Procedures, it feels like the focus of the episode gets a bit lost in the high-concept. It turns out that is most like a sensationalist narrative cultivated by Dukat to further his cause. The witness disappears from the station shortly after making the accusation. Rugal insists that his family life is perfectly happy. 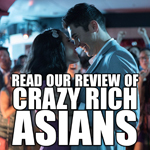 Being honest, that’s probably the best way to deal with the plot point as raised – it’s absurd melodrama to suggest the adoptive parents are indulging in explicitly racist nonsense. However, it skirts the meatier (and more substantial) issues around Rugal’s cultural identity and how others must relate to him. Like Dax, it feels like a cheat. There the interesting moral question was disarmed with a convenient plot twist. Here, the most potent ethical and moral question of the episode is pushed to the background and dealt with off-screen. There’s no indication that the debate was “long and difficult.” It was set up, and then it happened, off-screen. It’s a cop-out of a difficult question, and one I’d respect the show a lot more for dealing with on-screen. And yet, despite that, there’s a reasonable amount to like about Cardassians, as much as those elements feel strangely divorced from the heart of the episode. For one thing, it’s great to have Garak and Dukat back on the show. This is first time that Garak has appeared since Past Prologue and the first time Dukat has visited the station since Emissary. Cardassians does a nice job establishing both characters as more morally ambiguous than most Star Trek guest stars, and also offers an interesting exploration of Cardassian culture. To be fair, the Cardassians have already been well established on The Next Generation. Even their debut episode, The Wounded, established them as more than mere “bumpy forehead” villains. Episodes like Chain of Command hinted that the Cardassians were more than mere warriors or bad guys, villains quite adept at political manoeuvring and more than just a bunch of generic adversaries. However, the second season of Deep Space Nine devotes considerable effort to developing them even further – to the point where I’d argue that the Cardassians are as well-defined as the Klingons, despite the fact they featured less prominently. Using the human model, the brain model, Cardassians really work from their reptilian brain. I’m not making a value judgment about that. We all have that. Human beings have what is called a tripartite brain. There are 3 parts to our brain; the oldest part of our brain is the reptilian brain. So don’t cast any aspersions about a 1/3 of my brain and I’m a great defender of Cardassians so there’s a lot to be said about the reptilian brain. Reptilian brain knows what boundaries are. The reptilian brain knows how to take care of itself in order that the species survive. Now, having said that, there are downsides to the reptilian brain. And the Cardassians, it’s true, have a lot of that. You know, the militarism, and the brutality, which the occupation of Bajor is on a level with anything that the Germans did with World War II. That being said (laughs) the positive things – the trains ran on time, the streets are clean (laughs). It’s clear that Robinson has put a lot of thought into the philosophy of the Cardassians, but it’s an approach which makes sense with how the show would define Cardassians. The R-complex consists of the brain stem and the cerebellum. Its purpose is closely related to actual physical survival and maintenance of the body. The cerebellum orchestrates movement. Digestion, reproduction, circulation, breathing, and the execution of the “fight or flight” response in stress are all housed in the brain stem. Because the reptilian brain is primarily concerned with physical survival, the behaviors it governs have much in common with the survival behaviors of animals. It plays a crucial role in establishing home territory, reproduction and social dominance. The overriding characteristics of R-complex behaviors are that they are automatic, have a ritualistic quality, and are highly resistant to change. This fits the presentation of Cardassians quite well. They have been established as a race prone to territorial wars, and politically conservative and unadaptable (attempts to introduce democracy on Cardassia prove a massive failure in the fourth and fifth seasons) – capable of being violent and ruthless if the situation calls for it. It also fits with the idea that Cardassians value family, as argued here. “On Cardassia, family is everything,” Pa’Dar assures O’Brien. “We care for our parents and children with equal devotion. In some households, four generations eat at the same table. Family is everything.” It makes sense as a logical extension of their territorial attitudes – Cardassians defend and protect what is theirs. And yet, despite that, the revelation that family is a primary drive also helps temper some of the more unflattering attributes of Cardassians. 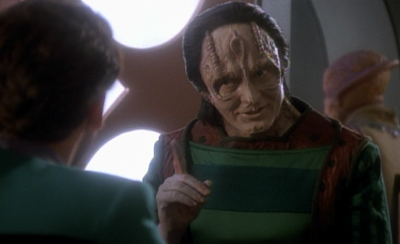 Up until this point, Cardassians have been almost exclusively portrayed as a race of antagonists. Sure, The Wounded did take care to point out that they were people too, but the episode revealed that the Cardassians were still preparing for large-scale war with the Federation. 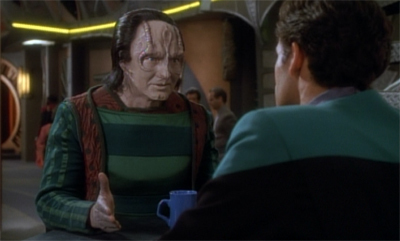 You weren’t expecting details of Garak’s past so soon, were you? 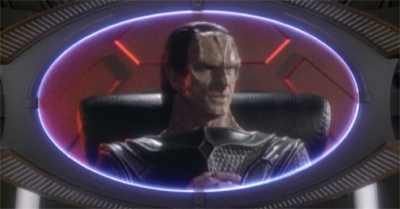 Cardassians are associated with war, brutality, torture, deception and sedition. In Past Prologue, the episode wisely refused to confirm that Garak was a good guy. When a “good” Cardassian eventually turned up in Duet, he seemed dedicated to proving to his fellow Cardassians how evil they were. These are clever and nuanced portrayals, but they hinge on the idea of Cardassians as inherently violent and aggressive, and toying with that expectation. Indeed, the last time we saw one, in The Circle, he was helping organise a coup d’etat on Bajor. Revealing that Cardassians are family-orientated as a species makes it a bit easier to accept them as more than just “evil”, in the same way that The Next Generation tried to develop Klingons as more than convenient Cold War stand-ins, or even the first season of Deep Space Nine put in a lot of work to expand the Ferengi beyond the status of “failed comic relief.” After all, the image of four generations of Cardassians sitting around the same table suggests that – at the very least – even these bad men love their mommas. It’s hinted that the civilian government is engaged in some sort of power struggle with military leadership. ” Isn’t there an inquiry about to begin concerning the Cardassians who were involved in the attempted military coup on Bajor?“ Bashir suggests, hinting that the events in The Circle were not the actions of Cardassia behaving as a unified entity. There are different groups within the culture who want different things, and not everybody wanted to spark a civil war on Bajor and risk war with the Federation. It’s a small thing, but it speaks to a lot of what was so fascinating about Cardassians on Deep Space Nine. Often on Star Trek, alien cultures become reduced to a set of generic traits, to the point where it’s almost expected that every member of the species adheres to those traits. It’s not necessarily a bad thing. After all, when you have only forty-five minutes to establish an entire alien culture (as Star Trek and The Next Generation frequently did), it makes sense to stick to broad outlines. Stretching the profile across multiple episodes gives the space necessary for definition. The Next Generation had done this, to a certain extent, with the Klingons. Throughout the show’s run, we got a sense of the political landscape of the Empire, the day-to-day realities of Klingon life. However, Deep Space Nine developed this even further with the Cardassians. 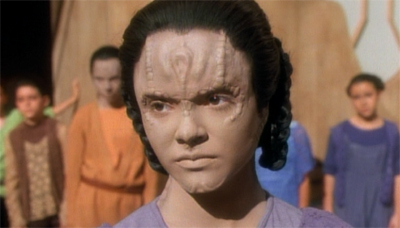 There were so many well-developed Cardassian characters with their own unique viewpoints that the race seemed a bit more nuanced and developed than most Star Trek cultures. 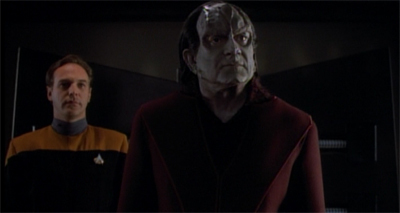 Adding a sense of discord to their internal politics – suggesting different Cardassians have different ideas of what being Cardassian means to them. Pa’Dar seems more reasonable and more civil than most Cardassian authority figures we have met so far, which probably has something to do with his role in civilian government. We will meet many other Cardassian characters with different perspectives on what it means to be Cardassian over the course of the series – Damar, Tain and Ghemor among others. 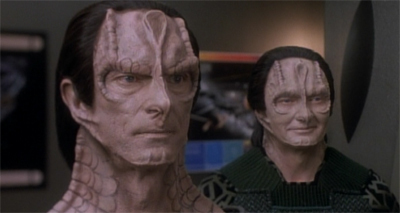 However, Cardassians also showcases the two most complex of characters – Elim Garak and Gul Dukat. Garak is an absolutely fascinating character, particularly because he refuses to adhere to a simple moral code. Why does he get involved here? Is this his attempt to see justice done for the children? That seems a little trite. Is it an attempt to screw over Gul Dukat? That seems a little petty. Is it an attempt to secure the civilian government for the greater good of Cardassia? That seems a little idealistic. We never get an explicit answer why Garak does what he does, and when Bashir calls him on it, he’s enigmatic. “But you don’t need me to tell you, my friend,” he explains. “Just notice the details. 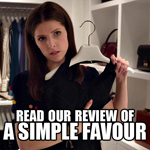 They’re scattered like crumbs all over this table we regularly share.” It’s an answer that should be frustrating, especially to a generation growing increasingly impatient with the tendency of arc-based television to avoid revealing anything ever. However, it isn’t. Part of that is because Garak’s enigmatic history remains one of the show’s few loose ends; part of that is Andrew Robinson’s performance; part of that is that almost any back story would serve to diminish Garak by making him more grounded; and part of that is because the show offers enough hints and possible explanations that we can trust that Garak does have a plausible motivation – we’re just not sure which one. And both Robinson and the script are careful not to make Garak too sympathetic. They don’t de-fang the character just yet. 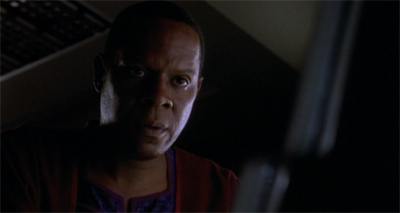 He spends most of the episode leading an eager young Bashir around like a dog on a leash, and he seems behoved to nobody’s philosophy save his own. There’s every possibility this is just Garak settling an old vendetta against Dukat, or simply toying with his next meal. 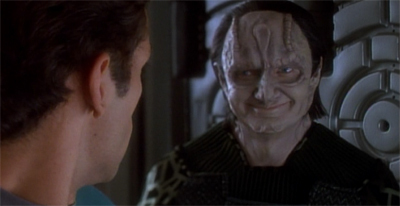 There’s also the suggestion that Garak is – like Kira – unrepentant about all he felt he did to do in the past. Visiting a Bajoran orphanage, he decides to wear his Cardassian patriotism on his sleeve. Ignoring the brutality of the Occupation and the cost paid in Bajoran lives, he wonders about the orphanage’s filing system. He politely informs the administrator that they have Cardassia to thank for their thorough records system. “They’ve taught many worlds, including this one, how to keep records.” Garak speaks the line in a surprisingly sincere manner. 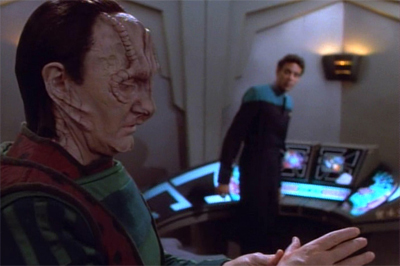 Garak doesn’t seem to be needling the administrator, prodding for a response as he does with Odo or Worf. The fact he fixes the orphanage computer suggests he respects quid pro quo. Instead, there’s every indication he believes that the Occupation might have been – in some small way, good for Bajor. The implication is that Bajor owes Cardassia some sort of debt for imposing its rigid order upon the weaker planet. And yet, despite that, there’s a moment of hesitation when the Cardassian orphans ask whether he has come to take them home. It’s only a fleeting moment, before Garak answers matter-of-factly and continues on his way. It’s enough to suggest that maybe, just maybe, he doesn’t quite believe what he told Bashir. “Children without parents have no status in Cardassian society.” Like a lot of early Deep Space Nine, this early instalment reads quite differently in light of future revelations. 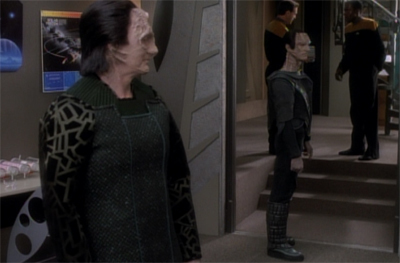 Given Garak’s own troubled family history, it’s not too hard to believe that the plight of these abandoned children might resonate with him on some level. 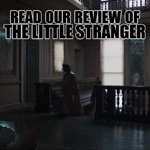 Certainly, the character’s childhood trauma developed into an adult sense of claustrophobia. At this point, Garak has lived a year in exile, and knows what it is to be without a home. He also knew what it was to grow up without a family, so it’s plausible that anything to help these children might alleviate some of his own personal issues. 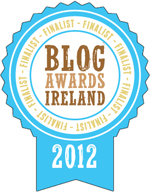 Of course, all of this is speculation. It’s probably too neat and too trite for Garak. However, it’s interesting how all of this hangs together so well. It’s a testament to Andrew Robinson’s superb performance and the skill of the writers in constructing Garak as a multi-faceted character, even this early in his creative life. 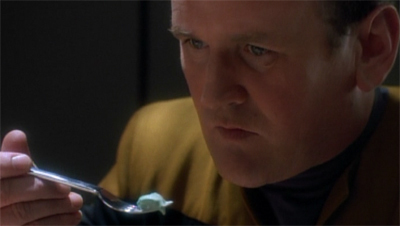 Garak would go on to be a major part of the show, and you can definitely see the seeds of that sewn here. As an actor, when I got the script, I didn’t realize Dukat was being set up to take the blame. But I played him as a man who was being set up. A man who was taking the dive because he had wanted to remove the children but his orders were to leave them. It’s very hard to argue that the script supports this position, but it does say a lot about Alaimo’s approach to Dukat, which was almost as involved as Robinson’s was for Garak. Cardassians also establishes that the lead characters here aren’t quite as flawless as their Next Generation counterparts. For one thing, O’Brien is a pretty big racist. And I don’t just mean because he uses phrases like “Cardie” or “Spoonhead.” He’s horrified to discover that Rugal played with Molly, warning Keiko, “Gentle was bred out of these Cardassians a long time ago.” Imagine any member of The Next Generation cast offering that insight. 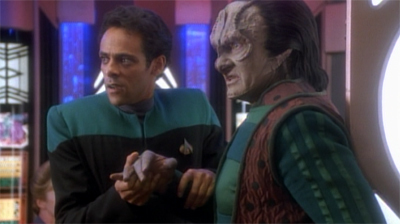 Bashir spends most of the episode just following Garak around like a helpless puppy, which doesn’t do much for his character. He seems to exist to ask Sisko for stuff that Garak could never ask for in person, reducing him to a gofer. 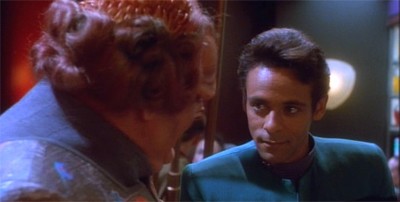 Episodes centring on the pair work better when Bashir has more leverage – like The Wire or Our Man Bashir. I can see why the writers would like pairing Garak up with other characters who were more likely to stand up to him – Worf or Odo. Cardassians isn’t a bad episode. There are some great ideas here, nice development of Cardassian culture and two great turns from two recurring guest stars. 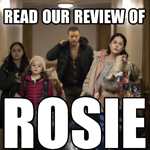 That said, it does feel a little unfocused, and it doesn’t really engage too much with its starting premise, instead branching off on tangents to avoid offering any real attempt at social commentary. 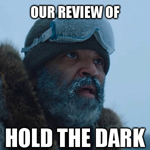 Still, it’s solidly constructed, and probably does a lot to establish characters and dynamics which pay off towards the end of the year.